It’s only a first step, but a project led by two UO scientists eventually could deliver welcome news to outdoor lovers and the medical community. By using genetic information, researchers hope to stop blood-feeding by mosquitoes. That, in turn, would stop the spread of many serious diseases. Focusing on Wyeomyia smithii, a species known as pitcher plant mosquitoes, a team of scientists from five institutions methodically sorted out 902 genes related to blood feeding and 478 genes linked to non-blood feeding among females. Pitcher plant mosquitoes, which UO biologists William Bradshaw and Christina Holzapfel have studied for decades, are found in swamps and bogs along the east coast of North America from north Florida into Canada. The species completes its pre-adult life cycle in the water of pitcher plants. The approach used in isolating the genes – reported in the online Early Edition of the Proceedings of the National Academy of Sciences – will be pursued in other species to identify which ones are universal, said Bradshaw and Holzapfel, who are members of the UO’s Institute of Ecology and Evolution. Next to be targeted are common house mosquitoes (Culex pipiens), which spread many encephalitis diseases, West Nile virus and heartworm; Asian tiger mosquitoes (Aedes albopictus), which is spreading rapidly in the United States and carries, among other viruses, dengue, Zika and yellow fever; and the African malaria mosquito Anopheles gambiae. 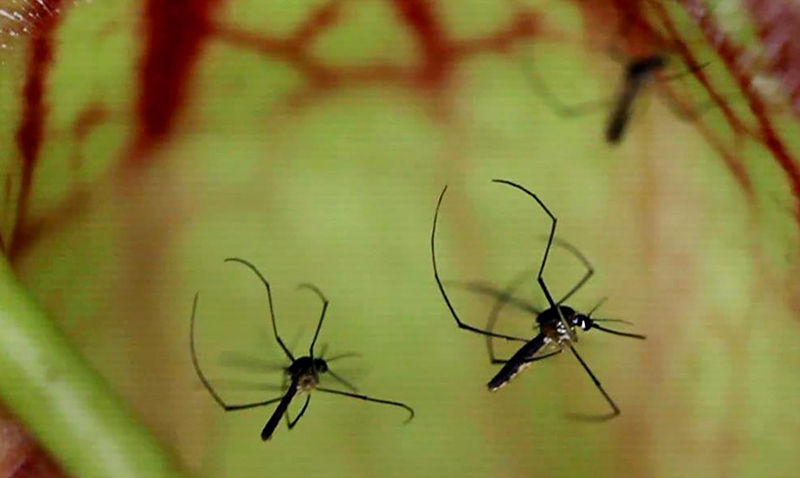 The research initially targeted the pitcher plant mosquito because it is the only known species to have females that either bite to obtain blood or are obligate non-biters – those that don’t seek blood. Bradshaw and Holzapfel said that they had realized the possibility 20 years ago that genes guiding these lifestyle differences existed and had evolved in nature, but the technology was not yet developed to isolate these genes. Females are the blood-feeding mosquitos, making them the vectors of diseases; males feed on nectar, as do female non-biting pitcher plant mosquitoes. In the project, funded by two National Science Foundation grants, the research team examined 21,618 potential genes in the pitcher plant mosquito. Over seven generations, they identified and extracted 1,380 genes that were determined to have direct effects on differentiating the biting and non-biting lifestyles. The step-by-step method involved strong, directional gene selection on a low-biting Florida population. By saving and mating only females about to blood-feed, researchers created an avid, voracious biting line. A group of disinterested non-biters also was developed from the same population by eliminating all females that bit or attempted to bite. The research team also examined known metabolic pathways of the isolated genes. Key proteins, like fatty acid synthesis and energy production, are being produced in both biters and non-biters, but the linking enzymes that determine which metabolic pathways are turned on are missing in the non-biters. “The car is gassed up and running at the intersection but the light is red,” said co-author Michael E. Pfrender, director of the Genomics & Bioinformatics Core Facility at the University of Notre Dame. Understanding specific genes and metabolic pathways are tied to blood-feeding behavior, Holzapfel said, will be helpful for future efforts by pharmaceutical companies to harness a control approach that nature already has established. Such an approach, she added, would allow mosquito populations to thrive and keep their place in the food chain.